Powder Coating: a Vital Element of Actuators Manufacturing | Indelac Controls, Inc.
Powder coating uses finely ground particles of pigment and resin that are electrostatically charged and sprayed onto electrically grounded parts using a dry finish process. There are two types of powder coating including thermoplastic and thermosetting. Indelac Controls, Inc uses the thermosetting process. We will later learn the unique color Indelac Controls uses. Thermoplastic powders are able to melt and flow when there is heat applied, yet they continue to have the same chemical composition after they are cooled and solidified. Thermosetting powder coatings, similar to thermoplastic coatings, also melt when exposed to heat but they are also able to chemically cross-link within themselves or even with other reactive components. Sandblast the product after fabrication. Once the powder is applied it is moved from the powder coating bay into the oven where it is heated up to gel the primer. Once the primer becomes heated and gelled it is moved back into the powder coating booth where the finished coat is applied. Finally, the product is baked in the oven until it is fully ready to move to the next stage of manufacturing. Powder coating is beneficial in the automation industry for a surplus of reasons. Not only is powder coating used on things such as actuators, it is also used on several types of parts and products including but not limited to store shelving, store fixtures, metal patio furniture, engine blocks, trailer hitches, lawn mowers, wheelbarrows, snow blowers, etc. Since powder coating is available in virtually any color as well as many different glosses and textures it is a beneficial process to use for many industries. Powder coating materials contain no solvents. Powder coating materials require no venting or filtering. Powder coating saves energy and cuts cost. It is difficult to make powder coating run, sag, or drip, so it has a presentable appearance on products. Operators who apply powder coating require minimal supervision and operator training. 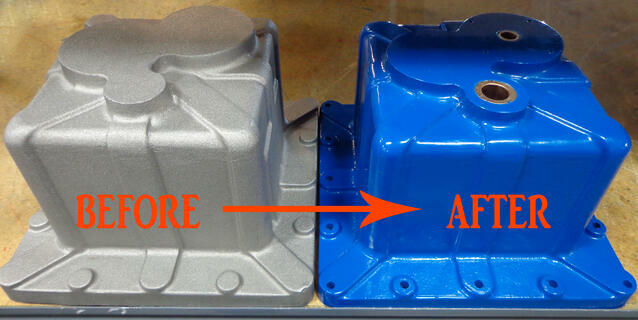 Products of powder coating are able to resist corrosion and prolong the life of the product. It is clear that there are many benefits of using powder coating, which is why Indelac Controls, Inc. and so many other companies use this process. You’re probably wondering how this process works. The answer is simple. Most commonly, powder coating materials require a spray device equipped with a powder delivery system and an electric spray gun. Spray booths are also used to enclose the application process as well as ensuring the collection of any over sprayed powder. In terms of powder delivery systems, they usually consist of a powder storage container as well as a pumping device. The pumping device transports the mixture of air and powder into feed tubes or hoses. See our previous blog about Industrial Valves: Innovative and Practical Products of Technological Advancements for more info on new composite materials for valves and actuators manufacturing. 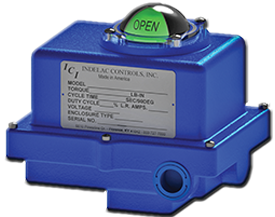 Specifically, Indelac Controls uses International ISO 12944 on our uniquely designed and American made products. Selecting specifications that work alongside with ISO 12944 has provided us with a peace of mind. Confidence has also been established in the fact that there is corrosion protection fit for our industries purpose. This has also allowed for an objective approach to our latest coating selection, a simplified matrix of coating systems to choose from, meaningful design life in the coating of our actuators, and also a standard that is universally accepted. Indelac also uses “Indelac Blue” polyester TGIC powder coating. This unique color is just one more reason Indelac Control’s products are unique compared to the competitors. The standard coating that is used for Indelac Blue and orange provides substantial exterior protection. Indelac Blue originated as a custom coating that was color matched with additional additives for casting purposes. This unique color comes from our powder coating supplier, Alpha Coating Technologies, LLC. *Technical Data provided by Alpha Coating Technologies, LLC. Using this system delivers confidence in our products. Protecting our actuators is something we take pride in. Reliable and safe field device operation is a crucial industry component. Electric actuators are used to automate industrial valves of any type and size. Since these and other actuators are used wherever pipework or even industrial valve automation are needed it is crucial that these actuators are safe from any possible corrosion. Even in water treatment plants, sewage treatment plants, refineries, or oil drilling rigs it is important to be sure that the products will not corrode and that their appearance will last through wear and tear. Corrosion occurs, but not with Indelac Powder Coated Actuators. There has been a continuous development in the world of exploration engineering. This in fact has implemented soaring energy cost that allow for the intensification of oil and gas extraction and various environmental conditions including the open sea, tropics, and polar latitudes. Since these environments are often salty, wet, humid, sandy, and have various air flow it is important to be sure the conditions do not put a toll on the actuators and other products. 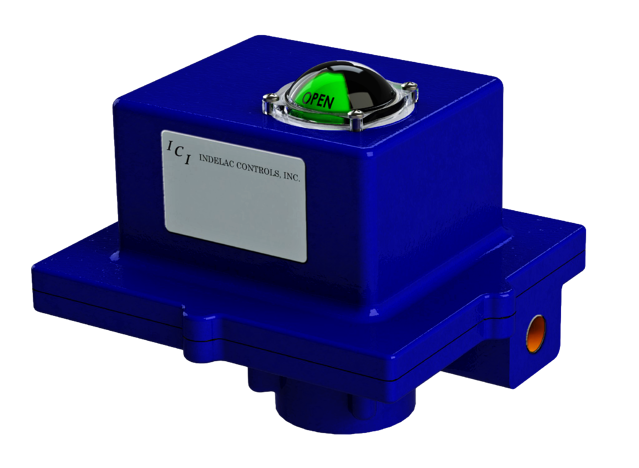 In the past few years many operating companies and other companies have become more aware of corrosion protection issues, Indelac Controls included. There are many corrosion categories one must be aware of. Indoor Only. Includes heated buildings with clean atmospheres. This includes rural areas and unheated buildings where a chance of condensation is possible. This includes sports halls, depots and warehouses without climate control. This includes Urban and Industrial atmospheres that have a moderate air pollution as well as coastal areas with a low salinity. This includes rooms with a high humidity and some possible air pollution. Examples are breweries and food-processing plants. This includes Industrial areas as well as coastal areas with moderate salinity like some chemical plants. This includes industrial areas with high humidity and an aggressive atmosphere. This includes coastal and offshore areas with high salinity as well as buildings in areas with almost permanent condensation and with high pollution. Under certain circumstances, it is possible that corrosion will appear at corrosion resistant component joints if there are is presence of combined materials. It is important to know that currently there is no known comparably effective corrosion protection available in the actuator market. This is also not something that happens in a day, these techniques take time to develop. Indelac Controls is committed to the overall appearance of our products and assures that our powder coating system is top of the line.